Before we discuss specific concepts relating to core or pivotal areas for intervention, it is valuable to consider some general variables relevant to development for children both with and without disabilities and that appear to be especially important for the habilitation process for children with autism. For example, development appears to be enhanced when responsiveness to stimulation occurs under typical conditions for extended periods of time; and it appears as though environmental stimulation needs to emphasize the relation in response-reinforcer contingencies. These areas are discussed later and relate directly to the development of current pivotal response interventions. 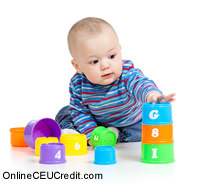 A number of studies demonstrate that for normalized behavioral and neurological development to take place, there must be regular and ongoing specific types of environmental stimulation. Early environments affect neurological, social, and cognitive development in developing individuals, as brain structures and nervous system tissues must be provided with sufficient stimulation. If an infant or child experiences insufficient stimulation, atrophy may develop, which can result in behavior such as social withdrawal, pathological shyness, explosive and inappropriate emotionality, and an inability to form normal emotional attachments (Joseph, 1999). Specific types of stimulation also seem to be important. For example, verbal stimulation by caregivers has been shown to predict children's later cognitive competence (Hart & Risley, 1995; Olson, Bates, & Kaskie, 1992). Furthermore, children' s active exploration of sensory stimulation appears to play an integral role in their development (Berlyne, 1978; Gibson, 1988; Lewis, 1978; Ruff & Saltarelli, 1993). Although there exists some plasticity in individual development, for children with autism who lack social initiations and often avoid contact with others, it does not appear to be enough to provide intense stimulation for relatively short periods of time, such as might occur in brief intervention sessions (cf. R. L. Koegel & Johnson, 1989; R. L. Koegel, Koegel, & O'Neill, 1989; Neville, 1988). Stimulation (specialized if necessary for children with disabilities) in typical environments for extended periods of time can maximize the likelihood of normalized environmental stimulation and provide opportunities for the children to learn the nuances of how to use new behaviors under complex social requirements of a given setting (MacDonald, 1986). Typical children are so responsive to the numerous stimuli in their environments that their parents often need to limit their child's very active explorations of stimuli. In contrast, children with autism typically interact with a very restricted number of stimuli, often in a repetitive or stereotypic manner (cf. R. L. Koegel et al., 1989). Thus, pivotal response interventions, implemented throughout the day in natural settings, that increase children with autism's responsivity to their environment have the potential to have widespread impacts because they can favorably increase the amount and type of environmental and social stimulation and learning interactions that have the social consequences that occur for typical development (R. L. Koegel & Johnson, 1989; R. L. Koegel & Koegel, 1988; R. L. Koegel, Koegel, & O'Neill, 1989). From a theoretical point of view, the behaviors of children diagnosed as having autism appear to be similar to those discussed in the literature on learned helplessness (Seligman, personal communication, 1979). Children with autism appear to be especially unmotivated to respond to complex social and task stimuli (cf. Clark & Rutter, 1979; R. L. Koegel & Egel, 1979; R. L. Koegel & Mentis, 1985; MacMillan, 1971; Rodda, 1977). It may be that for many children with autism, a motivational problem, resulting in reduced social responding, begins very early in life when the children experience failure due to central nervous system dysfunction. A cycle can begin wherein efforts to "help" the children by doing things for them can create conditions for learning that responding and reinforcement are independent (cf. Chan & Keogh, 1974; Gruen, Ottinger, & Ollendick, 1974; R. L. Koegel & Egel, 1979; R. L. Koegel & Koegel, 1988; Lewinsohn, Larson, & Munoz, 1982; MacMillan, 1971; Seligman, Klein, & Miller, 1976; Zigler & Butterfield, 1968). That is, individuals can learn that the consequences for their responding are noncontingent, thus depressing social initiations and lowering motivation (L. K. Koegel & Koegel, 1995). In addition, because social and communication interactions may be difficult for the children, they may revert to early forms of effective communication such as crying and tantrumming to get their needs met, and they may avoid interactions that are purely social. In contrast, teaching the children to initiate responding that is likely to have a low demand and high reinforcement probability, even if it is necessary to initially reinforce small attempts, may promote the learning that responding and reinforcement are related, and may reduce avoidance behavior. Thus, pivotal response interventions that emphasize relations between social communicative responses and their positive consequences appears to increase motivation to respond, thereby improving responsivity and increasing favorable environmental and social stimulation and interaction. In relation to the earlier discussion, the core area of motivation to respond to social and environmental stimuli appears to be a key pivotal area. That is, from a conceptual perspective, an important goal of intervention is to focus on increasing motivation to respond, so that the children self-initiate social, linguistic, and academic interactions, thereby providing complex stimulus input and learning opportunities throughout the day. Although motivation in itself is difficult to observe behaviorally, the effects of this process can be observed. That is, the effects of improved motivation, as the term is used in this article, refers to observable characteristics of a child's responding, such that an improvement in motivation is broadly defined as an increase in responsiveness to social and environmental stimuli. Some motivational characteristics that have been measured include increases in the number of responses a child makes to teaching stimuli, decreases in response latency, and changes in affect (e.g., interest, enthusiasm, happiness; R. L. Koegel, Carter, & Koegel, 1998). Motivation to respond to multiple cues and to self-regulate and self-initiate behavior also appear to be especially helpful in producing widespread improvements (R. L. Koegel, Koegel, & Carter, 1999). It should be noted that these areas are extensions of effective applied behavior analysis procedures. In the past, applied behavior analysis procedures repeatedly have been reported to improve the behaviors of children with autism, however, as science advances, refinements of the general behavioral procedures are now being documented to increase responsivity, learning, and generalization. - Koegel, Robert, Koegel, Lynn & Erin McNerney; Pivotal areas in intervention for autism; Journal of Clinical Child Psychology; Fall 2001, Vol. 30, Issue 1. The preceding section contained information about pivotal areas in intervention for autism. Write three case study examples regarding how you might use the content of this section in your practice. According to Koegel, what type of stimulation has been shown to predict children's later cognitive competence? Record the letter of the correct answer the CEU Answer Booklet.